What's at the root of your headaches and how to get ahead of them, naturally. Oh, the pain. A headache is never a welcome addition to your day but they seem to crop up more often than we would like. Headaches can be the result of many day-to-day factors, from unhealthy food choices to dehydration to overworking our minds and bodies. Here’s how you can get your head back in the game with soothing essential oil blends. Hungry, hungry, headaches. It’s simple: when your body is telling you it’s hungry, eat! Skipping meals can leave you feeling foggy and tired. And if you choose foods and drinks with sugar, cheese, alcohol or caffeine, you might make the pain worse. Fuel up on nutritious meals at regular intervals, and keep your water bottle close at hand to stay hydrated all day. Keeping everything running smoothly will take the pressure off your body and keep head pain at bay. Stress: we talk about it all the time, but what effect is it having on our whole body? Too much stress in our lives can disrupt our sleep, our digestion and even our ability to deal with pain — enter pesky, annoying, lingering headaches. Dealing with everyday stresses, like work, family, injuries and finances, releases chemicals into our bodies that can lead to headaches. Add a lack of sleep and pain to your already tender state and you’re at risk of creating a cycle of recurring head pain. To help ease the stresses of your day, your week or even your year, use Stress Release Soothing Face & Body Mist. Keep this balancing blend close by and reach for it whenever you feel like you need a calming influence. Exercise: it gives us a healthy glow, raises your endorphin levels and helps us feel strong. Sometimes we push ourselves too far and end up with all-over stiffness and pain. Add in the strain to your neck and shoulders caused by sitting at your desk all day long, and you’ve got a recipe for that throbbing, base-of-the-skull kind of headache. When your neck muscles have been overworked, it can cause tenderness and discomfort in and around your head. Try some gentle stretching and roll on Peppermint Halo Cooling & Soothing Oil Blend for the Head: you’ll have the pep back in your step in no time. 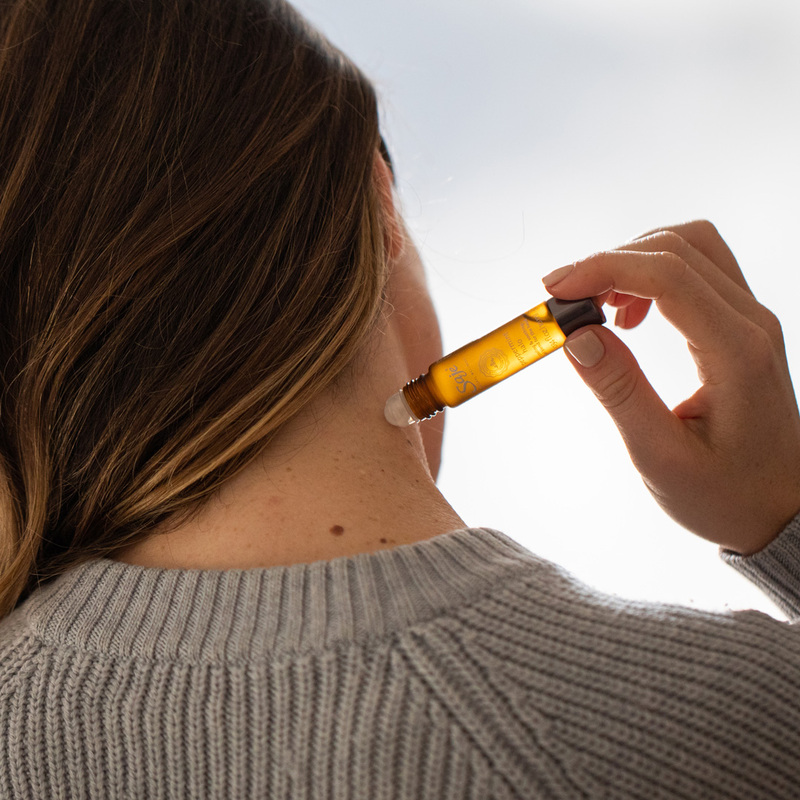 Apply along your neck, shoulders and hairline to create a soothing and cooling sensation that will satisfy the heck out of your head. Does this sound like your workday? Emails, documents, spreadsheets: repeat. If you’ve got a 9-to-5 lifestyle, chances are you’re spending much of your day staring at a digital screen. During all that staring, your brain is working overtime to adjust and readjust your eye focus, creating strain on your eye muscles and eventually, your head. To give your eyes and head a break, turn down the brightness on your computer and change your eye gaze by looking out a window or across the hall. To further soothe your head, reach for the invigorating sensation of our Peppermint Halo Wand. Dab this peppermint-based blend on hard-to-reach places — like your scalp — to soothe with a satisfying halo of peppermint. Headaches caused by poor posture are easy to come by, even though we’ve all been told to keep our shoulders back and our head up. From hunching over our desks to sitting in traffic for hours and hours, poor posture is at the root of our neck and tension-related headaches. Make a point of getting up from your desk every hour and rolling your shoulders down your back. Do some gentle neck stretches to relieve any built-up tension before a headache takes hold. When you’re going head-to-head with headaches, there can be a lot to think about. Remember to stay mobile, hydrated and well-fed — a healthy plant-based meal always helps us! Make it easy on yourself by picking up a limited edition Head Soother Kit with our favorite head soothing oil blends.